"Thompson Price has perfected the recipe for kitchen and bath remodeling"
...At least that's how one of our customer's put it. Since 1978, Thompson Price has helped more home-owners successfully remodel their living spaces than any other kitchen and bath remodeling company in Saint Louis. Find out why our recipe works so well — read testimonials. Are you thinking about remodeling or updating your home? Visit our resources page for information, articles and videos to get you started on the right track. Education is one of the keys to success! Are your cabinets falling off? Do you suffer from a poor design or can't host your family at holidays? Maybe your toilet is running or you have want a new kitchen sink. We can help. Thompson Price has been remodeling kitchens and baths in Saint Louis for a long time. 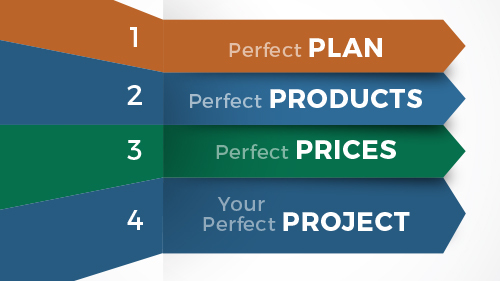 Find out why about our unique 4P Process and why Thompson Price is the right choice for your project. So, you've committed to making some updates in your home. What's next? It's time to talk! Find out more about what you can expect when you work with us. We can't wait to meet you. Visit our showroom for inspiration! Summer is here for kitchen remodeling and bath remodeling. Time to plan, design, build, and create your next bathroom or kitchen remodeling idea. St. Louis knows our kitchen and bath planning and design is second to none. Our quality baths, sinks, cabinets, refrigerators, and craftsmanship are what makes Thompson Price the referred team for contracting, custom building, and remodeling. We work with various budgets and measurements, and can make your next bathroom or kitchen project a success. Feel free to come visit our showroom or talk to one of our on-site designers. Centrally located off of Manchester Rd. near highway 270, next to Edward Jones, in Des Peres, Missouri.